(2016). NBO analysis and theoretical thermodynamic study of (5,5) & (6,6) armchair carbon nanotubes via DFT method. International Journal of Bio-Inorganic Hybrid Nanomaterials, 5(1), 53-60.
. "NBO analysis and theoretical thermodynamic study of (5,5) & (6,6) armchair carbon nanotubes via DFT method". 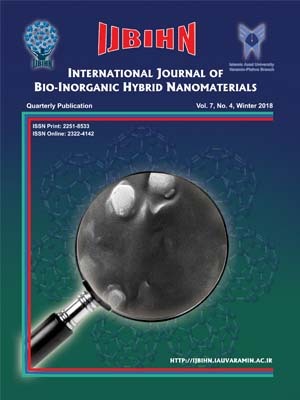 International Journal of Bio-Inorganic Hybrid Nanomaterials, 5, 1, 2016, 53-60. (2016). 'NBO analysis and theoretical thermodynamic study of (5,5) & (6,6) armchair carbon nanotubes via DFT method', International Journal of Bio-Inorganic Hybrid Nanomaterials, 5(1), pp. 53-60. NBO analysis and theoretical thermodynamic study of (5,5) & (6,6) armchair carbon nanotubes via DFT method. International Journal of Bio-Inorganic Hybrid Nanomaterials, 2016; 5(1): 53-60. In the present work, the structural and electronic properties, and conductivity of (5,5) and (6,6) Single Walled Carbon Nanotubes in the ground state have done by using the Hartree-Fock and density functional theory DFT-B3LYP/6-31G* level. Delocalization of charge density between the bonding or lone pair and antibonding orbitals calculated by NBO (natural bond orbital) analysis. These methods are used as a tool to determine structural characterization CNTs in the gas phase. The total electronic energy, dipole moment, natural atomic orbital energies, charge density, density of state (DOS), highest occupied molecular orbital (HOMO), lowest unoccupied molecular orbital (LUMO) energies, HOMO-LUMO energy bond gaps, the global index includes hardness (η), electronegativity (χ), electrophilicity index (w), chemical softness (S) and electronic chemical potential (μ) were calculated. We have reported our investigation on the conductivity and electronic structures of pure (5,5) and (6,6) SWCNTs. The calculated HOMO-LUMO energy bond gap show that charge density transfer occurs within the molecule and the results indicate that the conductivity of the CNTs, and also the semi conductivity could be justified.